These bring students together to have fun and focus on social principles introduced in each session. 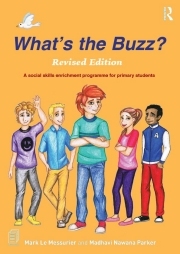 The games are not available here; however, the publisher has kindly given permission to display the SOCIAL GAMES in the first three lessons from each book (see below). The SOCIAL GAMES are also popular choices for mainstream class teachers to positively influence the emotional climate in their classroom. These games offer precious moments to unify, refresh and lift the spirits of a group. They can be drawn on as ice breakers and team building exercises to help build class cohesiveness at the beginning of the year, or are a sparkling remedy when the attention or the mood of the group starts to wane. So when the going gets tough, or when there seems to be one too many students in the classroom, think about using one of the 100 socially connecting games from both programmes. They're easy to use as well! This game can be played inside or outside. Players walk freely about a large space, but one of the players is nominated as "it". When "it" calls, "Back to back!" all players quickly find a partner and stand back to back. Then, "it" says "go" and players are free to move again. When "it" calls "Face to Face!" all players quickly find a partner, face each other, say "hello" and shake hands. Tell the players to be careful because "it" will try to get with a partner during the change. The player left out will become "it". The idea is NOT to become "it". Arrange the players so they are standing in a large circle. You begin by shuffling like a train across the circle making steam train sounds; have fun and exaggerate! Eventually, come to a stop facing one of the players in the circle. Look at them and say, "Hi, my name is, (your name) the Tank Engine". The person facing you responds with, "Hi, (they use your name), my name is (let's say their name is Mika). You raise one arm high and then the other saying, "Mika ... Mika ... Mika ... Mika ... Mika ... Mika ..." You place Mika in front of you holding his waist. Mika pulls away from the station with you in tow. Both shuffle across the circle making steam train sounds. The train journey continues until everyone joins the train and has led the group. Arrange the group into a circle. Explain that everyone will have the chance to roll the ball to someone as well as receive it. As participants roll the ball they give a friendly greeting to person who receives it (being sure to use their name). As the ball is received the participant gives a friendly thank you (always using the name of the person who rolled the ball). The game continues until everyone has had at turn. Start by demonstrating the idea. For this is an old favourite it is best to set a 5 minute time limit. Players will require space to move about and must carry a pencil and small note book (or sheet of paper) to record ideas. On "go" students walk about and use friendly greetings as they pass one another; a thumbs up, a double thumbs up, a wink, a "hello", a high five, a smile, a "hi", a bow, blowing a kiss, a little wave, a "how are you today? ", a long wave and so on. The person being greeted must respond in a friendly way. As the game progresses encourage participants to drop to the floor and add a new way to greet to their list. They may use their own ideas as well as collecting ideas they observe from others. The aim is to develop the longest possible list of friendly greetings within the time limit. Once the time limit is reached move students back into the social circle. Move from student to student asking them to give one friendly greeting idea and showing how it is done. Continue to do this until all ideas are exhausted. Ask students to add up the ideas on their list. Find out who has the most! Select two players. Ask them to stand up, move to the front of the group and position themselves either side of you. These players will be asked to talk about a topic for 30 seconds in front of the group, but, they must talk 'at' you, 'non-stop,' using many of the characteristics from the 'How to get attention using demanding behaviours' checklist. Your response while they do this is one of disapproval; you stand stony faced with arms folded, looking at your watch. Once they have finished ask the audience to score their performances by holding up fingers on one hand. Five fingers up would indicate a superb performance. Add up the scores to determine a winner. Continue until everyone has a turn. Whisper the name of an animal to each participant. For a group of four give two players the same animal name, and in a group of eight give two pairs the same name – everyone else has a different animal name. Once the name is given players are not permitted to speak or tell what animal they are. Instead, on "go" each person makes the sound and movement of the animal they have been given while they move about. As soon as they find the same animal as themselves they sit on the floor together. Once all players are convinced they either have a partner or there isn't one, stop the game and ask each player to tell which animal they are. Children enjoy playing this game over and over! This is an ideal introductory game as it offers a way for students to give a little information away about themselves, and to learn more about others. Explain that each of them will be given a turn to state two things that are true about themselves and one thing that is a lie. Each of the three statements should be confidently delivered. The rest of the group will try to guess which statement is the lie. Guessing the lie is the aim of the game!The best idea is for an adult to begin so they can model how it is done. All players, except the sleeping pirate, sit in a circle on the floor. The sleeping pirate is blind folded and sits cross legged in the middle of the circle guarding a large bunch of keys on the floor nearby. Silently choose a child to creep up and ever so quietly take the rattling keys away from the pirate. Once they have the keys they attempt to return to their place in the circle and place the keys on the floor behind their back without the pirate hearing anything at all. The sleeping pirate listens intently, but says nothing. Finally, the sleeping pirate is asked to remove their blindfold and have two or three attempts to guess the raider (number of guesses depends on the size of the group). It is fun to return to the social circle, look at what each pair decided to collect and hear them justify their decision. This listening game is best played in a large room. Responding to the commands below, students quickly perform the appropriate actions. Give the group a while to warm up, practice and remember the commands, then start removing the slowest players until only one or two are left. Have everyone stand well away from each other. Tell them that you are going to read a story about Mr. and Mrs. Wright and that they will need to listen very carefully. When they hear you say the word "right" they will have to jump to the right. When they hear you say "left" the will have to jump to the left. This game is a lot of fun, but each person's success hinges on them concentrating, listening and remembering. It's all about following directions to the letter! This is a story about Mr. and Mrs WRIGHT. One evening they were baking cookies. Mrs. WRIGHT called from the kitchen, "Oh, no, there is no flour LEFT! You will need to go out to the store RIGHT away." "I can't believe you forgot to check the pantry," grumbled MR. WRIGHT. "You never get anything RIGHT!" "Don't be difficult, dear," replied Mrs. WRIGHT. "You could have LEFT by now and been on your way. It will only take twenty minutes if you come RIGHT back. Go to the Post Office up on the main road, and turn LEFT at the stop sign. Then go past the fruit shop we usually go to, and turn RIGHT, and there it will be on your LEFT," declared Mrs. WRIGHT as her husband LEFT the house. Mr. WRIGHT found the store and asked the shop assistant where he could find the flour. The shop assistant pointed and said, "Go to Aisle four and turn LEFT. The flour and sugar will be on your LEFT." Mr. WRIGHT made his purchase and walked RIGHT out the door. He turned LEFT, but he couldn't remember where he had LEFT his car. Suddenly he remembered that he had driven Mrs. WRIGHT'S car and that his car was in the driveway at home RIGHT where he had LEFT it. He finally found the RIGHT car and put his things RIGHT inside. Eventually, a weary Mr. WRIGHT found his way home. Mrs. WRIGHT had been waiting impatiently. "I thought you would be RIGHT back," she said. "I LEFT all the cookie ingredients on the kitchen counter, and the cats got into the milk. You'll just have to go RIGHT out again." Mr. WRIGHT sighed. He had no energy LEFT. "I am going RIGHT to bed," he said. "Anyway, I need to go on a diet, so I might as well start RIGHT now. Isn't that RIGHT, dear?" This legendary game can be played inside or outside. If outside, commence by explaining the boundaries for students to stay within. Choose a location you wish students to arrive at. The idea is that you do not tell them the destination you have selected. They will need to listen to your instructions to find the point you have in mind. The only clues you will deliver are words such as; "freezing" "cold" "warm" "warmer" "colder" "hotter" "really hot" "boiling" "cooler". Your clues gradually drive the group to find the hottest spot. When they arrive let them know they have successfully listened and followed instructions. It is also great fun to divide the group in half. Have half watching while the others try to find the hottest spot as it's just as much fun to watch! Game, What's on a face? Game, "Good morning Mr. President"
Game, Draw me if you can? Game, Guess what I'm drawing?